Vacant land owned by the county was sitting fallow and pulling down property values. Fix up the properties by adding gardens and getting the community involved. When property specialist Jill Robinson joined the Oakland County, Mich. Treasurer’s Office four years ago, her past job experience came in handy. “In my previous jobs with the Michigan Land Bank and with a local nonprofit, The Greening of Detroit, I was able to see firsthand the benefit of community gardening and getting vacant land into the care of local residents,” said Robinson. She knew there were a lot of gardens throughout the county, but it didn’t seem like there was an organization to help them connect with each other, she said. The Treasurer’s Office had an abundance of vacant lots because of foreclosures in the Great Recession. Does your county have a great program? “I was charged with finding productive uses for the properties that went through tax foreclosure, but were not purchased at a land auction,” she said. A program called Growing Pontiac was born. “We wanted to start a program that was partnership-based — where properties could start being utilized by people for good,” she said. The local Missionary Baptist Church had successfully started a few gardens in the county, so “we started meeting in their building, then gradually we began meeting other places,” she said. Eventually a benefactor and friend from an organization in Detroit called Recovery Park paid for strategic planning in 2016, which allowed the new program, a public-private partnership, to set goals, begin structuring the organization and set up a leadership team. Typically, the county sells properties to neighbors or residents, or local community groups. Many of them say they are going to plant a garden — which may be community-based — but are often for personal use, Robinson said. The county provides information on how to get involved with Growing Pontiac. There have been approximately 15 organizations and multiple individuals that have started community gardens. 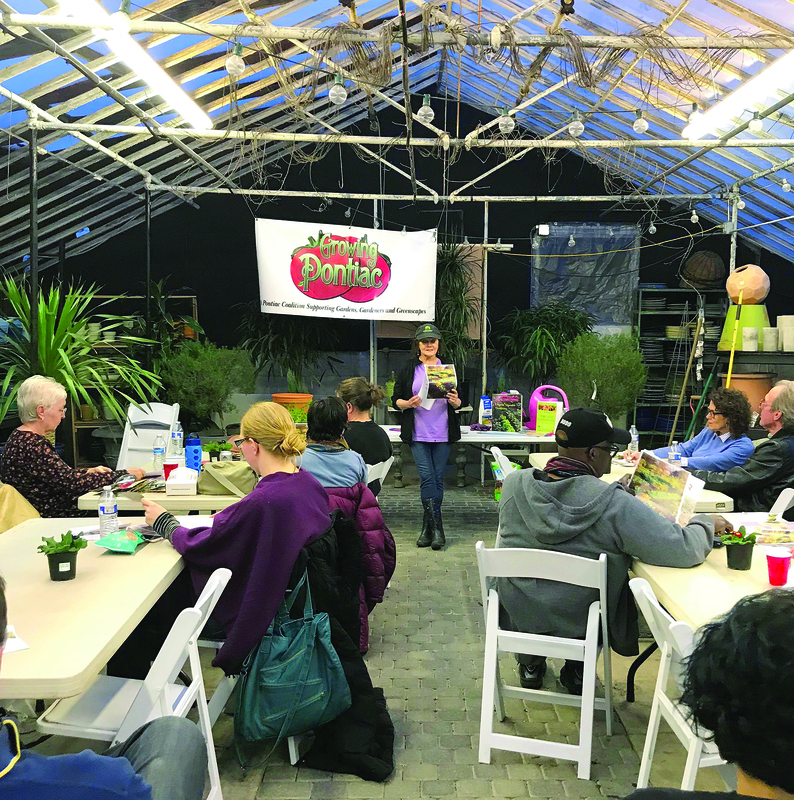 Under the county program, the county holds classes such as Garden Planning, Fermentation, Friends of Chickens, Compost 101 and What’s That Weed? “We also have ‘friend events’ at local restaurants so we can meet other like-minded people and continue connecting the community,” Robinson said. Meanwhile, the county is just getting started on a Growing Pontiac Garden & Teaching Space dubbed Paddock Farm. It’s about 2 acres and the county plans to have raised beds, rainwater collection and phytoremediation. People also get involved in the program via social media and word of mouth. “We all speak about Growing Pontiac at neighborhood meetings or anytime we run into people,” Robinson said. Non-profit housing partners OLHSA, Habitat for Humanity and other housing groups also help out and spread the word about the program. The program also relies on donations from individuals and businesses including Home Depot and Lowes for seeds and a local garden store for classroom space. “It’s been a great effort in relationship-building.” Robinson said. One partner garden donates a majority of its produce to a fresh food store, pop-up markets and to area nursing homes. “Overall, people want to connect with each other, so get out into the community and talk,” she said. “Growing Pontiac” is the recipient of the 2018 NACo Achievement Award in the Community and Economic Development category.